It is time to dash off to the Pixie Snippets Playground again with a card for the fortnightly challenge and this time it is a simple offering of paper piecing. Various snippets of patterned paper have been used for the background, a floral panel and of course for the dress and umbrella. Snippets of white and green card were used for the ovals and also for the sentiment. The card featured on Di's post this week is quite humorous and of course uses stamps and dies which are offered as the prize - if you fancy owning them it would be worth entering for an opportunity to go into the 'draw. Morning Val. Thanks for leaving a lovely comment on my long overdue blog post the other day. I've been skipping back through yours and see you've been in a similar boat. I had to smile at your earlier post where you mention 'time management' and 'slowing down', lol! I think I can empathise on both those scores. I know for a fact my time management leaves a lot to be desired. I do see you've not lost your knack of producing beautiful cards from your snippets. This one is lovely and I do like that image. Wow Val - I love this card! A beautiful design (and image) to begin with and the real icing on the ckae is the fabulous paper piecing and how you tied it in with the two backing papers. Perfect! 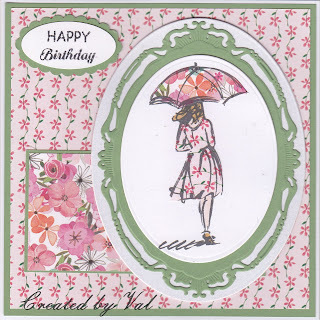 A beautiful card Val, I love how you've teamed the papers to the stamped image. Beautiful card Val, I love that stamp set and your paper piecing is lovely!